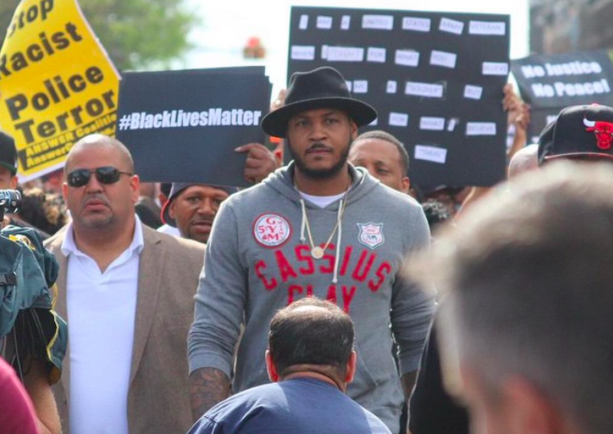 Knicks superstar Carmelo Anthony travelled to Baltimore on Thursday to participate in a protest against police violence following the death of Freddie Gray. Melo was born in Brooklyn, but grew up in Baltimore after his family moved when he was eight. The incident has sparked protests and riots in Baltimore and other US cities (including New York) this week. The Baltimore Orioles had to cancel one game, ask fans to remain in the ballpark after another, play one that was closed to the public, and move a series to Florida due to safety concerns. While the public unrest has led to several riots in the Baltimore area, most of the protests have been peaceful, including the one Anthony marched in on Thursday. This entry was posted in Articles and tagged Carmelo Anthony, Carmelo Anthony Baltimore, Carmelo Anthony Freddie Gray, Carmelo Anthony Protests, Knicks news on May 1, 2015 by Tommy Rothman.